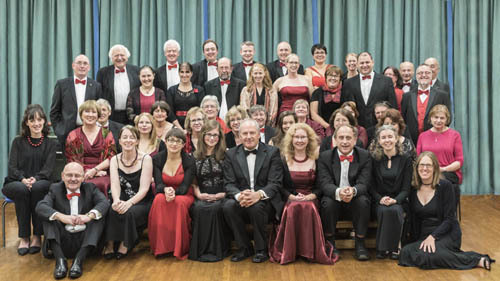 For more photographs of our 2016 concerts please see our ﻿Gallery 2016﻿ page. Early December brought the start of Christmas music with our annual winter concert at Kennet Valley Free Church in Calcot. As this was the final concert of our 40th Anniversary year, we were delighted to have many past members of the band come to join us in the band and audience. A few musicians played throughout the concert and another six joined in for the final 3 pieces of music - they can be seen in the photo here. Two former musical directors also conducted us for a couple of pieces each. In the interval we cut an anniversary cake which was shared with our audience. Our Autumn concert was great experience for the band in the beautiful St John's Church in Mortimer. We were overwhelmed with the support from the audience, with so many people from the local community turning out to enjoy an evening of live music. The comments at the end of the evening blew us away: "stunning", "best performance by a concert band I've ever been to", and many more! Being conducted by the magnificent Rob Wiffin brought out the best in the band, and as we were playing our favourite music, it was one we thoroughly enjoyed performing. We were also delighted to be joined by artist Anne Proctor, and photographer Sue Totham, who brought along a range of beautiful prints of their work to display to the audience. As part of the "BBC Get Playing the Summer" initiative, South Berks Concert Band, with support from Dawkes Music, welcomed over 50 budding musicians from the local community to the day where we gave everyone the opportunity to try lots of different instruments, from drums to glockenspiel, flute to saxophone, and trumpet to euphonium. We featured on BBC Radio 3! 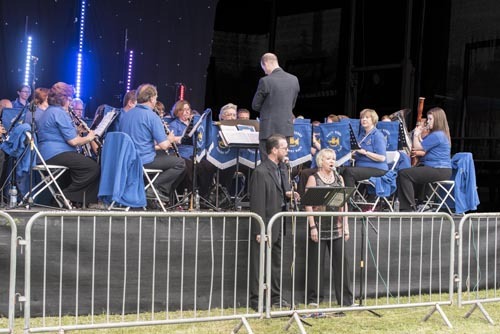 We are thrilled to announce that South Berks Concert Band was chosen by BBC Get Playing to be featured on Radio 3's In Tune programme on Thursday 4th August, when listeners could hear us performing With Each Sunset by Richard Saucedo. We were one of only 10 groups to be chosen by the BBC to be featured on their shows this year! 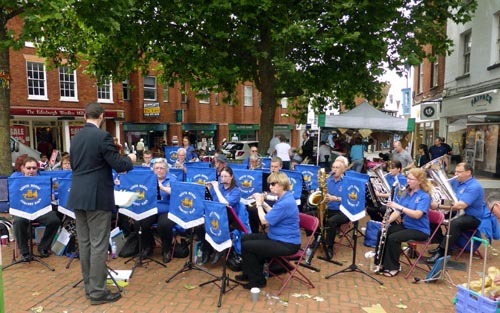 The band returned to Wokingham on the morning of Saturday 9th July to perform outside the Town Hall. We entertained shoppers as they came to the marketplace. Guest conductor Stewart Lewins led us through a variety of musical favourites such as Bandology, Instant Concert, Hootenanny and a Beatles medley, much to the delight of the listening crowds. In the 2nd of our 40th Anniversary concerts we played in the marquee on Mortimer Fairground. Included in the musical selections for the afternoon was the premiere of a brand new piece of music commissioned by the band to celebrate our anniversary. The piece was called "Highdays and Holidays: The Mortimer Revel" and was written by world-renowned composer, Philip Sparke. We were also joined in our celebrations by The Hurst Singers, who led the audience in a rousing proms-style ending, with pieces such as Jerusalem and Land of Hope and Glory. 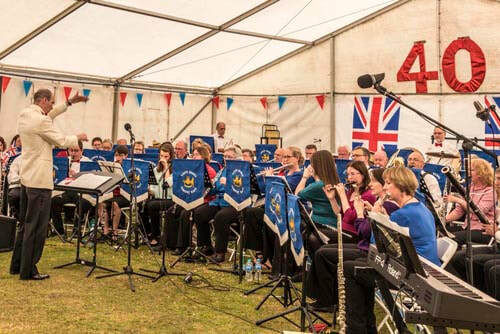 The band were delighted to be asked to perform as part of Mortimer's Queen's birthday celebrations on the Fairground on June 4th. We played a selection of British music, starting with Dambusters, and including other favourites such as Elizabethan Serenade, Sailing By and Those Magnificent Men in their Flying Machines. We finished our set with some patriotic pieces - Jerusalem, There’ll Always be an England, I Vow to Thee my Country, and Land of Hope & Glory - when we were joined by the fabulous singers David and Valerie Stephenson. Glorious sunshine at Henley meant lots of people were at Mill Meadows to listen to us play! Instant Concert turned out to be very popular, and Les Miserables and Lion King were hits with many of the audience. It was lovely to see so many children also dancing along to our music. We began our outdoor performances for the year with an appearance at Bradfield Mayfayre. The forecast was for heavy showers during the afternoon, worrying for Paul as he had to conduct from just outside the marquee - fortunately the rain held off until we were playing the last few notes of the final piece so he managed to stay dry! 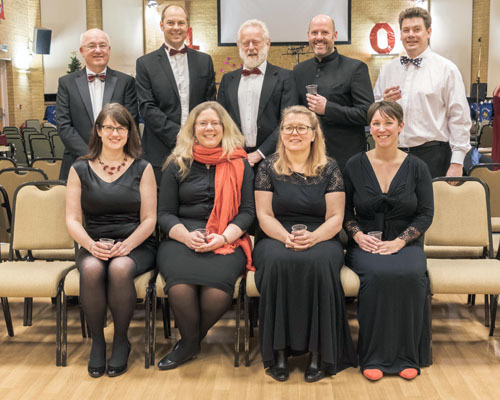 Our first concert for our 40th Anniversary celebrations featured a range of music from the past 40 years, including themes from films, TV shows and musicals, plus lots more. Some of the highlights of the concert were "Star Wars", "The Lion King" and "Dad's Army". The band introduced the audience to the wonderful piece called "The Witch and the Saint", one of those voted by band members as one of the their favourite pieces from the past 5 years! Sforzando Sax also featured in this concert with their version of Queen's "Bohemian Rhapsody".